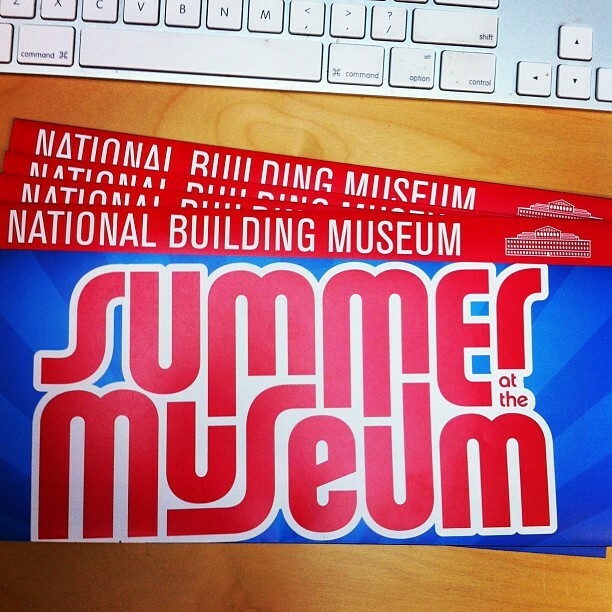 I've been a graphic designer at the fabulous National Building Museum since I moved here, and for my first job out of college I couldn't have been luckier. I was immersed in a culture of design, architecture, and education; I joined a staff of incredibly intelligent, interesting, and kind people; and I was trusted with a wide variety of creative, complex design projects that challenged me and gave me the satisfaction of seeing them through to implementation. I eventually recognized I'd grown hungry for a greater challenge, and in the last year or so I began to look around for one. I was searching for opportunities that would let me grow in a direction I want to grow creatively, but not finding many here that spoke to me. 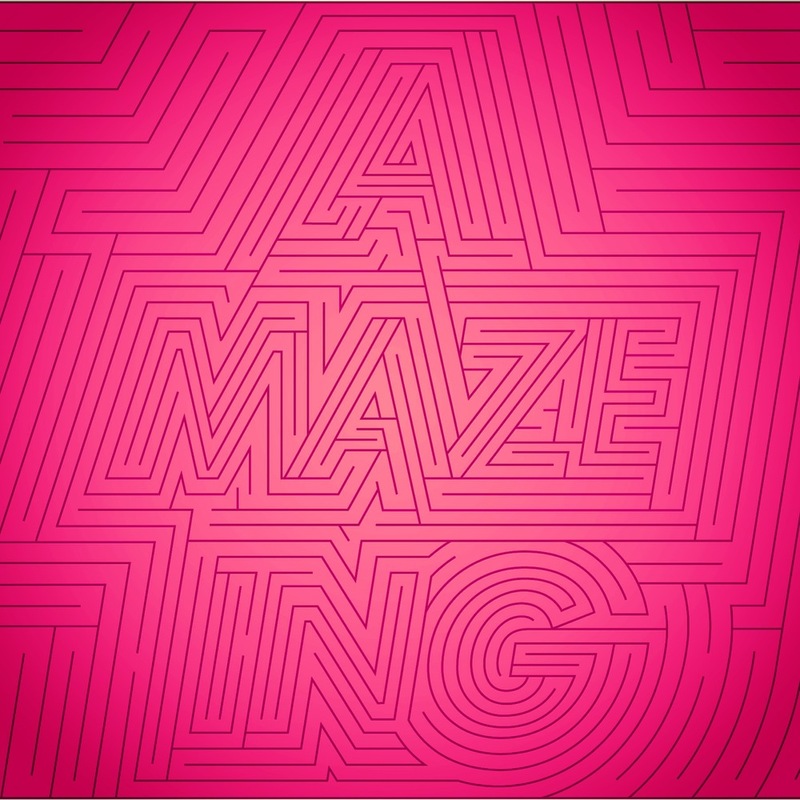 I know I want to work more with type and I want to be in an environment with more designers. I'd love to work for a traditional design studio, working on identities, packaging, websites, and more for a variety of clients, but am open to a lot of different opportunities. Some advice my dad had told me kept sticking in my head: "Always be running toward something." For a long time I focused on the something. It had to be defined in order to run toward it, right? What if I was running away instead? I put those questions on hold last summer to finish and release my first typeface, Delphi. 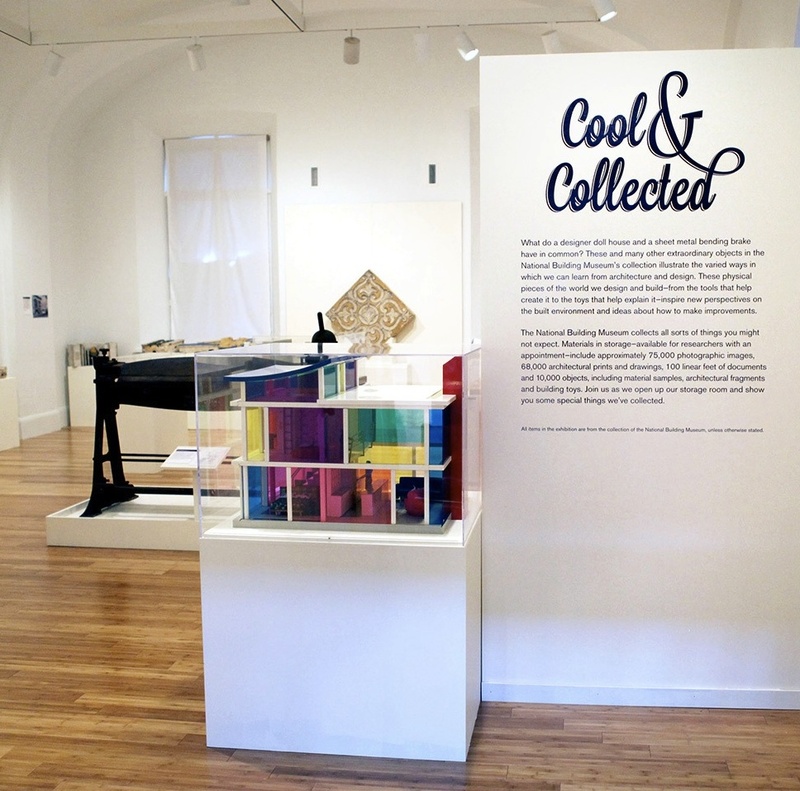 I attended my fourth TypeCon—in DC that year!—and, as always, was impressed by everyone's talents, interests, and simply how nice everybody is. It's an inspiring community to be among, and once TypeCon ended I devoted all my energy to figuring out my next steps. I began reaching out to older, more experienced designers for advice, and overall they said, "Go where the opportunity is." So I started testing the waters in New York. I went to lectures and met with designers and emailed their designer friends and met with them. Finally on a recent trip, the resounding message was, "You're doing all the right things, but you should just move here first." I'm moving to New York the first week of January. I've got a place to stay while I look for an apartment and will be freelancing while I explore opportunities for a stimulating, challenging, full-time job in design. I'd be lying if I said I wasn't terrified, but more than anything I'm excited. I'm still running toward something, I'm just not sure exactly what yet. Which is ok—it exists because I'm making it happen. It's opportunity; it's adventure; it's the variable I'm solving for. I'm increasingly confident about whatever lies ahead, and it's not without the help of a TON of people. Everyone who's emailed with me, skyped, gotten coffee, introduced me to new people, friends new and old in NYC, even folks who've just told me I'm going to be fine and haven't completely lost my mind, you've been encouraging beyond measure. THANK YOU! So here it goes. I've said my goodbyes at work and with friends, I've packed my possessions into a storage unit (leads on apartments are welcome! ), and now I'm telling the internet so it's really legit. I'm hitting the ground running in 2015—toward something. See you next week, NYC. I'm lucky to have a number of friendships rooted early in my childhood—some of my very first pals in life are still close friends today. When one of my first friends, Nicole, got engaged, I was thrilled to design her save-the-dates and invitations. Nicole and I met when we went to preschool together and, incidentally, her future husband Daniel was just a few years ahead of us. This meant we all had the same adorable school photo one year, so for the save-the-date I merged Nicole and Daniel's school photos, as if they'd been together all along. We printed them on magnets to create the ultimate school-photo fridge adornment for friends and family. Inspiration for the invitations came from Nicole's plan to use ribbons as decoration throughout the wedding, but it would be a formal affair and she wanted an invitation that would be elegant and timeless. I decided to photograph sheer, metallic ribbons in different arrangements to use as decorative elements, printed in black and silver ink for a little shimmer. 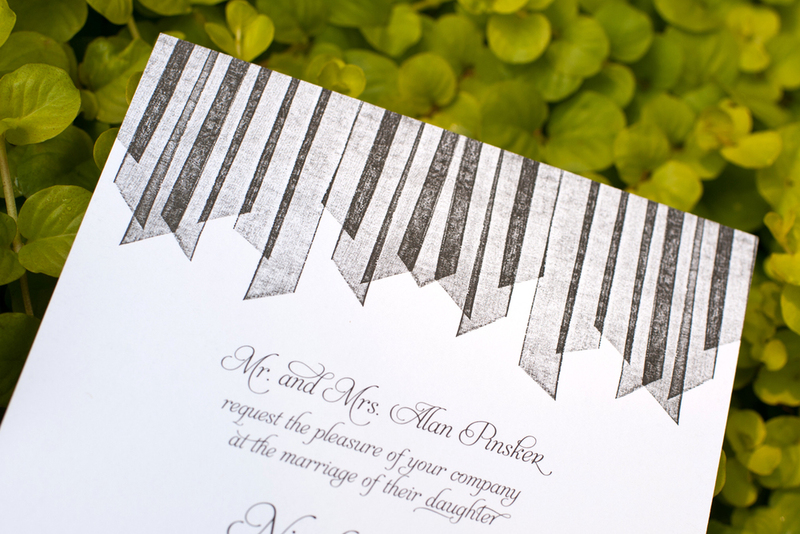 The elegant but playful typopgraphy and silver wash on the back conveyed the occasion's lighthearted sophistication. The invitation itself is composed to suggest a chuppah, the awning under which the bride and groom stand during a Jewish wedding. We used icons to indicate guests' dinner choices on the RSVP card, and I filled them with the ribbon texture so they blended with overall look. Additionally, I designed a logotype for Nicole and Daniel to use however they pleased. 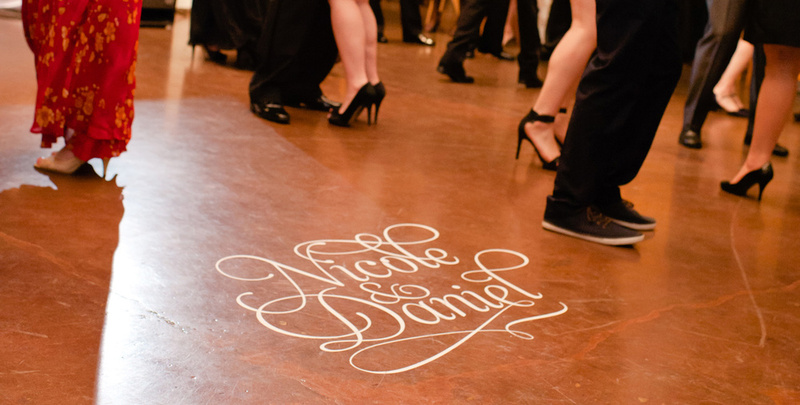 They ordered a stamp to use for thank-you notes and hospitality bags, crafted custom coasters, and even went as far as to order a decal for the dance floor! Many thanks to Angie Webb, aka Suburbanite Photography, for the photos! Invitations printed by Spectrum Printing. Magnets by MagnetStreet. Congrats to Nicole and Daniel! Nothing says “love” like lettering in gouache. 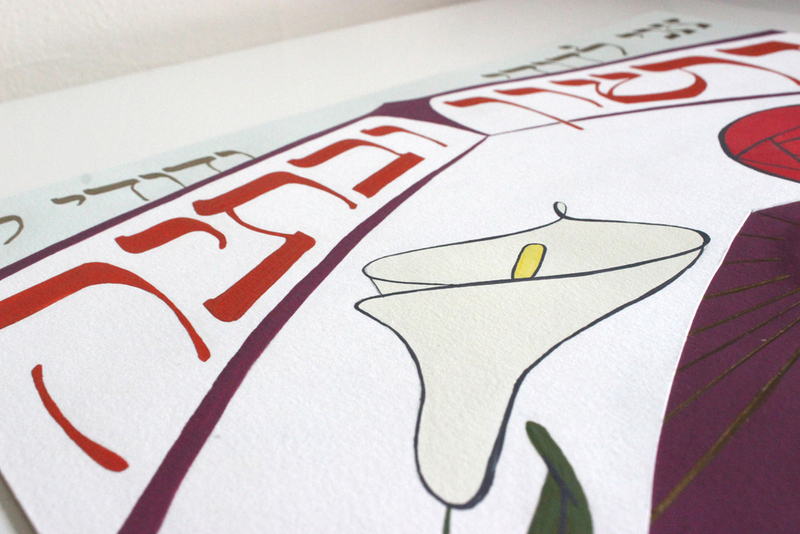 In Jewish weddings, bride and groom sign a marriage contract called a ketubah, which records the date, location, and witnesses, among other details, and validates the marriage under Jewish law. Traditionally these documents are beautifully decorated—pieces of art—and hung in the home. My parents had a very plain ketubah; it is not on display in their home. So as a gift for their 25th anniversary, I decided to make a decorative ketubah for them, not ro replace the original, but to serve as a piece of art and tribute to their marriage. One of the biggest influences on my personal aesthetic is my parents' collection of art deco posters, toys, and furniture, so I referenced art deco pattern books and stained glass windows for inspiration. I designed the layout and hand-painted the whole piece, except for the text of the actual contract. I used primarily designer's gouache and gold acrylic. 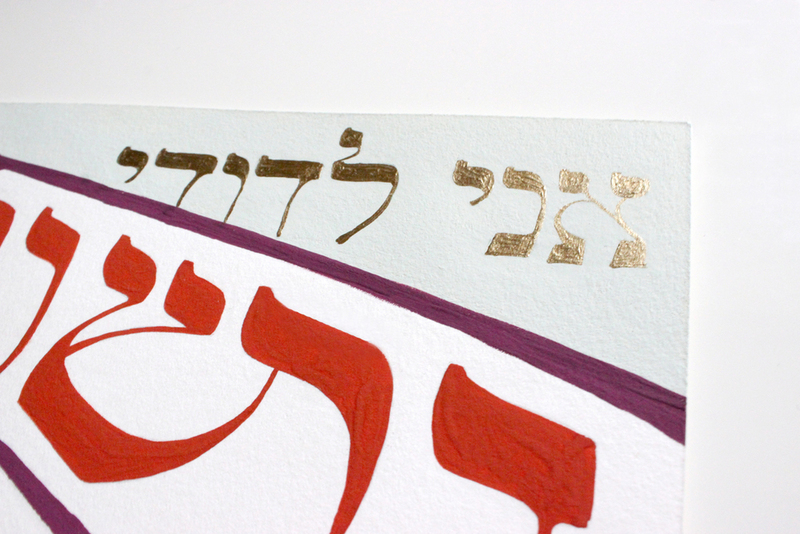 I researched Hebrew lettering and custom-lettered the text at the top: in orange is my parents' Hebrew names, and in gold above that is the sacred phrase "I am my beloved and my beloved is mine." I was especially excited for the chance to make a ligature using Hebrew letters! I went on an extraordinary trip to India this past February as part of the grand prize my CHANGE submission won in the American Jewish World Service's Where Do You Give? contest. In addition to the incredible sights I saw, experiences I had, and people I met on the trip, the design and lettering fanatic in me was surprised and thrilled to discover that nearly all the trucks on India's chaotic roads were decorated with elaborate and colorful lettering and illustrations. I learned that truck owners paint their vehicles to mark their ownership and distinguish them from other trucks on the road. Depending on the type of truck, there are some required labels such as “goods carrier” or the request to honk when passing, but there seems to be endless room for creativity in ornate lettering and decoration—in English and Hindi. The artistry and skill that go into the decoration of these trucks all over India is stunning, so here are a few shots I took of the colors, stylized motifs, and imaginative lettering. If you'd like to see more, I've got extensive collection on Flickr.